HRR from igetwind.com is also a valuable tool in my mind. It is currently free however I would pay. I would also pay for Victor's information if it was readily available all the time via a website. One of the things the computer models provide is a sense of gustiness. (something the human forecasts don't provide that well). Another nice thing about the computer models is that they can be updated regularly. A good example of this can be seen from the three pictures below. -Igetwind's hrr from 11:00am run. 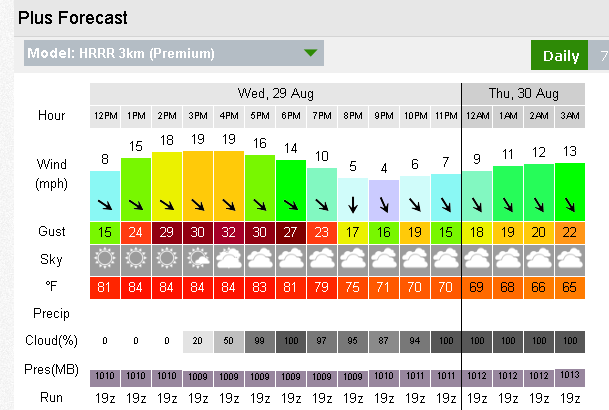 -Igetwind's hrr from 12:00 run (notice that forecasts for gusts have increased slightly since the previous run). -IKite's HRR (I couldn't locate a timestamp of the runtime). Okay enough talk... I'm going kiting!!! Sorry Big John but I'm calling BS! Your car is parked in the same spot almost daily. Is Secret really the secret wind sauce??? Nope. Don't get me wrong, it's good, but I bet it has something to do with it being 2 minutes from your house. I enjoyed some smooth wind and "decent" swell. I remember seeing Victor out there so I knew I had made the right choice. You add windfoiling to toy van. You go out in sub 11 mph, relearn to up-hual, never get anything done that needs to be at home. Need therapy to decide if you're going to kite, or windfoil from Event Site. Thu Aug 30, 18 5:59 am Igotta laugh! I am thinking of making the 14hr drive from Canada for next week. Would stay Sunday - Thursday but at a loss for long term conditions. I am learning to foil so have that in my back pocket if it’s light. I have checked iKitesurf but hoping for some local knowledge. 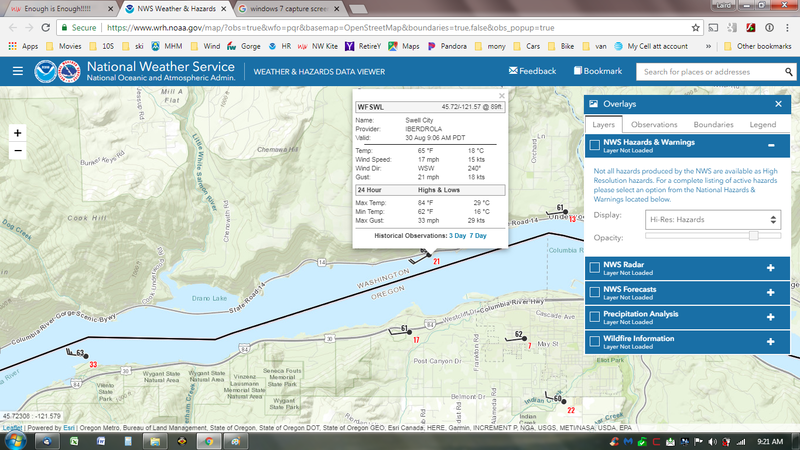 I'm one of the iWindsurf Gorge meteorologists that is "good but not great". When you're viewing any of the forecast model options on iWindsurf or iKitesurf, switch to Detailed mode. (In the image you attached above you were in Detailed mode.) The run time is the row labeled "Run". In your attached example, it says "19z". 19z is the same as 19UTC, which corresponds to 12PM PDT. On a somewhat related note, about 7 or 8 years ago, our entire Gorge forecasting team (Crysta, myself, Stu, and Mike) actually spent about 3 days with Victor the Inflictor and with Bart discussing Gorge forecasting. It was a big pow wow. George McLean was even there. At that time we invited Victor to be a part of the iWindsurf team but he declined. Maybe he wants to reconsider? We obviously don't strive for mediocrity. But, as has been stated, we can improve. So, any comments, complaints, compliments, quandaries, etc. Please share with us. Email our support team or PM me, and I'll happily share my email with you to correspond directly. Here's what Victor is talking about - the Iwind observations available on NWS. Thanks for the link LDHR.. Good find Victor! When you're viewing any of the forecast model options on iWindsurf or iKitesurf, switch to Detailed mode. Ben - the detailed models is why I rate your service as good - not great. It's not in synch with your human forecasts. The detailed model predicts 8 mph for Stevenson today. The detailed model predicts 12-13 mph for Swell today. Looking at your models the answer would be "don't bother - models forecast light winds". But if today is a good example - he would have missed out on decent winds if he used the models which consistently forecast 50% too light. Your daily forecast, 3 day, and current conditions are GREAT! The forecast models bring your overall rating down. Still a bargain at subscriber prices - satisfied customer for 20 years. I will continue to be a happy subscriber to ikitesurf for multiple reasons. 2) Your site is easy to navigate (I still use many features from the old site). 3) You provide a plethora of information, history, and statistics. 4) It is my understanding that you paid for and maintain the wind meters that are now available via Victors link. Thus without Ikite's service those sites would not currently exist. Without continuing to support Ikite those sites will not be maintained and new meters will not be developed. There is always an opportunity for additional entries into the wind market. I will support all of those that I feel are bringing value including my friend Victor. If I might ask for a request it would be a report card system. It would be nice to have a simple table that shows the different forecasts vs actuals such that we can go back in time and learn. We could learn how different wind meters don't represent properly in certain conditions (Wind direction seriously affects the accuracy of most wind meters). We could learn how some models are better for some situations (light wind, East vs West wind, different locations, time of year). It would be nice to be able to go back in time and look at a site's forecasts after you just kited it to gain a better sense of forecast accuracy(I currently do this regularly with wind meter history). 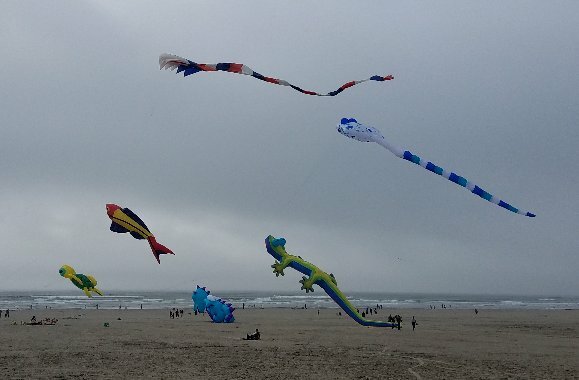 I track and forecast wind based on the animal windsock kite scale. Today is a solid 4.9. Tomorrow should be about the same. Victor, go work for ikitesurf already. Seems like a simple solution to me. We get to see your forecast and you get paid. Ikitesurf already has the amazing infrastructure in place. I mean, am I missing something here? Because that seems like a pretty simple solution to your wind forecast rant. I find ikitesurf to be valuable resource. I am not going to throw them under the bus after receiving 10 years of solid forecasts. This August was particularly weird. We had this hot humid overhang in Portland that lasted longer than I have ever seen. I am sure that confounded the forecasters. Ikitesurf easily saves me more in gas and time than the cost of subscription. I have not taken the extra step to go beyond the forecast and start studying models, charts, pressure gradients etc. And perhaps it is time I should. That being said. Most of us pay for the convenience factor of the forecast. My primary concern is to avoid being skunked. I don't want to go, get skunked, and end up wasting my time and money driving from Portland. However, if the forecast was for no wind and all of a sudden it ends up being windy. I am less concerned. Because thats not getting skunked - I would have found something else to do. In this sense ikitesurf is a clear winner. I focus my efforts on all day long solidly windy days via their forecast and frankly, prior to this year weird August weather, I had not been skunked in a very very long time (years). I'm an ikitesurf/iwindsurf fan too, and have been for many years, and will remain so for years to come. There is a lot of great information, that's easily accessible. That said, this summer the forecasts were almost comically off. It kind of became a joke at the Event Site. It didn't seem like to me, that there was any kind of "coming to Jesus" moment for the forecasters. Rather, it was more of the same day after day--way off. I foil now, and the foreasts almost don't matter, because it's almost always foilable, I live in HR, and I can simply zip down to the river when the leaves rustle in my yard. For others though, who don't have the benefit of the local advantage, I think it got pretty frustrating. The forecast is a part of what is paid for. I think it's reasonable to expect it to be mostly right, most of the time. I don't feel like that was the case this summer. I kite all year and usually get about 150 sessions. I use iKitesurf and the forecast map quick look model. It’s pretty good at showing where the strongest wind will be. The values are bs but that doesn’t matter. I’ll figure out what to rig when I get there. Ikite is quick and convenient and having quick access to the sensor readings in a list organised by wind speed is worth a few dollars per month. Huh that’s weird When I follow the NWS link above I only get the free weather stations not the subscription stations like swell and Viento Arlington etc.